Demon Keeper is an isometric sprite-based builder RTS in the vein of Dungeon Keeper. 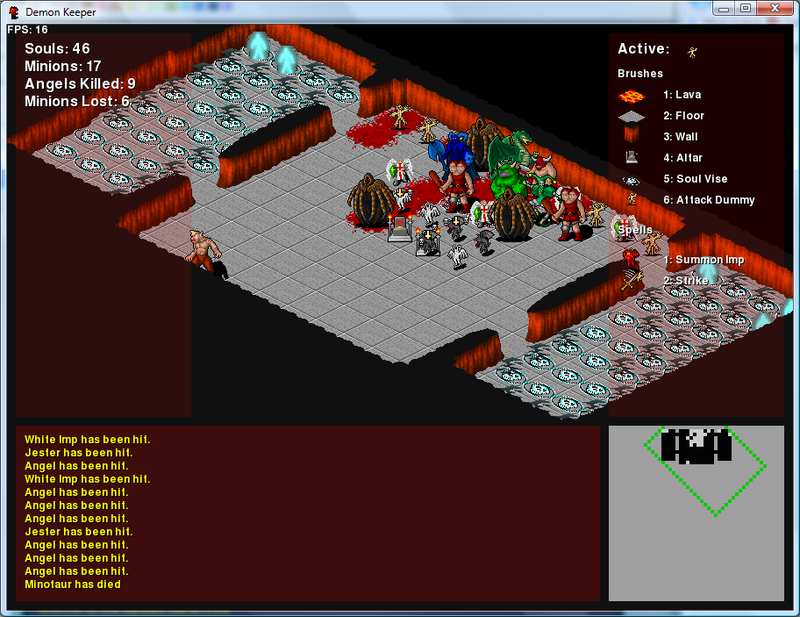 Written with python and pygame, supports fully manipulable terrain and upgradeable combat units. On the right hand of the screen, you will see a list of brushes and spells. Press the corresponding number to select a brush, or hold Shift and press the number to select a spell. Left clicking on the screen will activate the given brush (by placing that feature) or spell (by casting it). Right clicking will erase the features present on a tile. Spells use up souls to cast, so you’ll need to capture some if you want to cast them. You may do this by placing Vises, into which Imps will then chase the souls. Once a soul has been trapped in a Vise, it will become full and cannot trap any other souls, so be sure you always have extra vises on your map. To strengthen your minions, you will need to build attack dummies, where they may train. Some of your minions will work on these dummies and evolve into more fearsome creatures. Imps will not train, but rather worship at altars. This will also allow them to evolve into more powerful forms, but has the additional effect of summoning minions. By building altars for your imps to worship, and dummies for your minions to train, you can strengthen your forces. Developed as part of the 2009 SomethingAwful.com 30-day Game Programming Challenge.